Twelve teams. Eleven games. Four days. One champion. Those are the essentials of the Pac-12 Women’s Basketball Tournament, which starts Thursday morning at KeyArena in Seattle. As four ranked programs (three in the top 10), and at least three more in the NCAA Tournament picture descend for the weekend, this year’s field promises at least a little March Madness before the real thing later this month. Colorado’s Kennedy Leonard drives past Emily Potter and Megan Huff. Photo courtesy of Pac-12 Network. Both teams in the tournament’s first game enter looking to solidify postseason spots with at least one victory in Seattle. The pair split the season series, each winning on their home court. The Utes are led by their post duo of senior Emily Potter and junior Megan Huff, the latter Utah’s lone All-Pac-12 pick. They’ve played close against the conference’s top tier, but have no wins in six tries against the top four seeds in the Pac-12 Tournament. Utah is, however, coming off back-to-back overtime losses against UCLA and USC in the last weekend of regular season play. 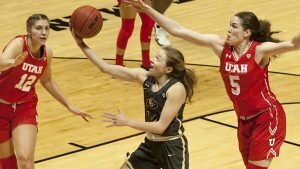 “I think when you come in as an eight-seed, you kind of have to have a little bit of an us against the world feel,” said Utah head coach Lynne Roberts. Utah was without both Huff and Daneesha Provo for both games of their season-ending Los Angeles road swing, and there’s no word on if either will be ready for Thursday. “I was really proud of our team, I think they were proud of themselves, because we knew that our backs were against the wall, the odds were stacked against us, and man, they fought like crazy,” Roberts said. Junior guard and All-Pac-12 selection Kennedy Leonard leads the charge for a Colorado team that went just 1-7 in January, but has bounced back since, says head coach JR Payne. The winner has the unenviable task of playing top-seeded Oregon on Friday, a team that boasts three All-Pac-12 players in Sabrina Ionescu, Ruthy Hebard, and Maite Cazorla and the conference Freshman of the Year in Satou Sabally. The Ducks took down Colorado by 19, and Utah by 16 in a Rocky Mountain two-step in January. With a win over Arizona on Sunday, the Ducks clinched their first Pac-12 regular season title since 2000. The Ducks also hold the top spot in nearly every offensive category, leading the Pac-12 in scoring, scoring margin, and both field goal and free throw percentage. Ionescu leads the Pac-12 in scoring, averaging over 19 points a game, followed close behind by 18 a night from Ruthy Hebard, who also leads the conference in field goal percentage. Cal’s Asha Thomas drives on Washington’s Missy Peterson. Photo courtesy of Pac-12 Network. The second day of the game features a 20-win Cal team that can ill afford the blemish on their resume that would come with a loss, and a Washington team on a 10-game losing streak trying to end the year on a high note. 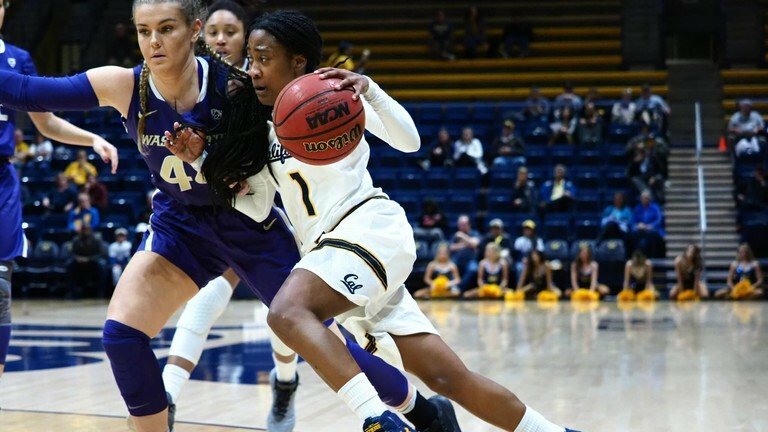 While junior forward Kristine Anigwe remains at Cal’s core as the team’s leading scorer and rebounder, averaging 17 and 9 per game, the Bears have also benefitted from the breakout freshman season of guard Kianna Smith. 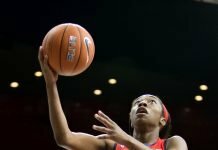 “She’s been such an important piece for us all year, there’s no question we don’t win the number of conference games we’ve won or overall games without her, but for sure I think her kind of being in a really good rhythm, knocking down shots, being a little more confidence at this stage is incredibly important for us,” Gottlieb said. It’s been a rough year to say the least for the Huskies, who have just a single conference win to their name (a Jan. 21 home victory over Washington State), but the team has played many conference foes close, with nine losses by 11 points or less. One bright spot to an otherwise dreary season has been the breakout campaign of sophomore guard Amber Melgoza — Washington’s lone All-Pac-12 selection — who’s averaging nearly 19 points a game. Washington is coming off an 86-79 loss to Stanford on Sunday, a game the Huskies led by eight after one quarter, and remained within four into the fourth quarter. “I just think that we have a team that was completely focused on winning possessions and battling through possession, one possession at a time, and not looking at the overall game, and on Friday they did a really nice job of staying focused possession-by-possession,” said UW head coach Jody Wynn. UCLA will play the winner on Friday in the quarterfinals. The Bruins beat Washington by 17 in their lone matchup in Seattle, and knocked off the Bears by 36 in Berkeley and by 8 in Los Angeles. 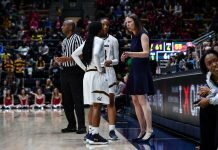 While head coach Cori Close said it’s a balance between fighting for the conference title, and understanding her team is built for a long NCAA Tournament run, she knows her seniors — Kelli Hayes, All-Pac-12 pick and the conference’s leading rebounder Monique Billings, and conference Defensive Player of the Year Jordin Canada — want to raise the trophy in Seattle. Aliyah Mazyck has been key for USC this season. Photo by Maria Noble/WomensHoopsWorld. The second session Thursday kicks off with a 7-10 matchup that features a potential NCAA Tournament team in USC. 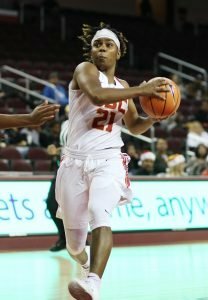 Under first-year head coach Mark Trakh — though it’s his second tour of duty with the Trojans — the team has surprised many with a .500 conference record, thanks in part to a pair of Pac-12 All-Defensive Team picks in guards Minyon Moore and Aliyah Mazyck, and All-Pac-12 forward Kristen Simon. 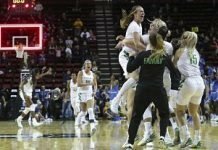 Despite high expectations entering the season — after a surprise run to the WNIT semifinals with wins over BYU, Wyoming, UC Davis, and Iowa — the Cougars have won just three Pac-12 games, and enter the tournament on a six-game skid. While not grappling with the same injury concerns that hampered them last season, Washington State has been without head coach June Daugherty since late January, after she took an indefinite leave of absence for medical reasons. This past weekend, the program was rocked again by the sudden passing of strength coach Dave Lang, which led to the cancellation of Sunday’s scheduled league finale with Stanford. Sophomore forward Borislava Hristova has provided much of the scoring punch for the Cougars, while Alexys Swedlund is averaging just over 10 points a night. The winner gets a matchup with the defending Pac-12 Tournament champions, as Stanford tries to repeat for the first time since 2013, when the Cardinal wrapped up a streak of seven straight tournament titles. The Cardinal are led by a pair of All-Conference seniors in Brittany McPhee and Alanna Smith — the team’s top two scorers — along with All-Freshman guard Kiana Williams, who is averaging just shy of 10 points a game. ASU’s Kianna Ibis and Arizona’s Lucia Alonso fight for ball control. Photo by Patrick Breen. 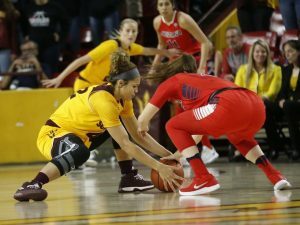 An in-state rivalry closes the slate on day one, as the Sun Devils attempt to lock down an NCAA Tournament spot against a rebuilding Wildcats squad under second-year head coach Adia Barnes. Arizona enters the tournament losers of their last six, and 10 of their last 11, but played Oregon close in their regular season finale, cutting their deficit to five in the fourth quarter before the Ducks pulled away for a 74-61 win. Forward Sam Thomas is one to watch for the Wildcats, named to the Pac-12 All-Freshman Team, leading first-year conference players in rebounding, steals, blocks, and minutes, while sitting second in scoring, and third in 3-point percentage. Meanwhile, the senior-less Sun Devils are coming off losses to Oregon and Oregon State this past weekend. “I thought we were solid with our rebounding, we were solid with our defense in some ways … but I feel like this team knows that they’re just a lot better than what they played,” said ASU head coach Charli Turner Thorne of the weekend. The Sun Devils — who boast the top scoring defense in the conference — cruised in back-to-back regular season matchups with the Wildcats two weeks ago, with a 25-point win in Tempe, and a 24-point victory two days later in Tucson. “It’s difficult to beat a team three times, and trust me, we know that,” Turner Thorne said. The winner gets to face perhaps the most surging team in the Pac-12 in an Oregon State squad that has won its last seven games. Rueck praised the “unbelievable leadership,” from All-Pac-12 center Marie Gulich, while sophomore guards Kat Tudor and Mikayla Pivec averaged 12 and 11 points per night in the regular season.